A while ago I was watching Ricardo and Friends on the Food Network and he made something called Dukkah which sounded pretty interesting. 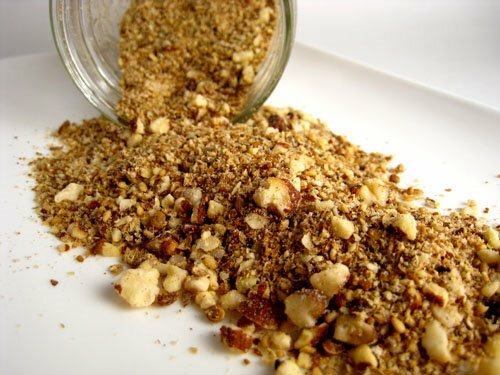 Dukkah is an Egyptian blend of nuts, seeds and fragrant spices. I searched the web and quickly found a bunch of recipes and each of them had a different combination of nuts, seeds and spices. I tried to distill all of the recipes down to the core ingredients of a basic dukkah and came up with this combination. Most of the dukkah recipes used either almonds or hazels nuts but I decided to use both. I wanted a chunkier texture so I just chopped the nuts by hand though you could place them into a food processor to make a finer dukkah. One recipe called for dried lemon zest which I will have to try next time. Since dukkah is used to add flavour to dishes toasting the nuts, seeds and spices is an important step to bring out the full flavour of all of the ingredients. Since I was already toasting so many things I decided to toast up some chili peppers and made a fresh chili powder blend for the dukkah. The dukkah turned out to be pretty aromatic and tasty. I first tried the dukkah by dipping bread in olive oil and then in the dukkah. Since then I have used the dukkah as a garnish on soups , salads and other vegetables (like roasted cauliflower). Dukkah sounds like it would make a great crunchy crust for fish, chicken, pork chops, etc. I keep finding myself thinking, “Can I put dukkah on this?”. Toast the almonds and hazelnuts in a preheated 350F/180C oven until fragrant, about 10-15 minutes. Finely chop the nuts after the cool. Toast the sesame seeds, coriander seeds, cumin seeds, peppercorns one at a time in a pan until fragrant, about 1-3 minutes. Grind the seeds and peppercorns in a mortar and pestle. Note: Mix in the chili pepper a little at a time and test the heat with some bread and olive oil. I consider myself pretty in the loop with what’s going on on the Food Network, but I’ve never even heard of Ricardo and Friends before. This Dukkah sounds like it has lots of possibilities…very new and interesting recipe. I saw the same show Kevin…still getting ’round to trying it. So, how long does Dukkah keep? Do you keep it in the fridge, the freezer, or an airtight container? And how the hell did you get those nuts chopped so finely BY HAND???? Sounds yummy, do you think it would be nice over ice cream, mabey coconut? I’ve never heard of Dukkah or of Ricardo and Friends… sounds like I have fallen behind in my Food Network viewing! I love the components of this spice mixture. I’ll have to make some up and give it a try. Vicarious Foodie: Ricardo and Friends is a Canadian Food Network program. I am not sure if it is broadcast in the US. neen: I made my first batch of dukkah about 3 months ago and I have been keeping it in an air tight jar on my spice shelf and it is still in great condition. chef erik: I am not sure if dukkah would go with ice cream. Chili heat goes well with chocolate ice cream so it might work. I will have to experiment with it. sounds great-I’ve never tried this before! I saw this show too! It’s on my list of things to try. Looks great! I love making spice blends and pastes…they’re so convenient to have around. I’ll have to try this dukkah. I used a similar mix as a crust for fish but i didn’t know it was named Dukkah. Really cool! Wow, that’s pretty cool. I bet the texture it gives dishes is quite intersting. I’ve never heard of Ricardo, I guess I need to look for him. That spice mixture looks interesting! I’m keeping that recipe, thanks! Bread, olive oil and dukkah is one of my favourite lunches…your recipe looks delicious 🙂 I think I can identify with that “what can I put dukkah on now?” feeling. BTW if you like dukkah you might well like Za’atar (this is presuming you don’t already know about it) which is basically a mix of thyme, sesame seeds and sumac and is addictive! That looks like a great thing to have handy. I made dukka or za’atar a few week back and love it on pita breads or mixed in with goat cheese for a spread on crackers. It is delicious also on fried halloumi cheese as well:D The possibilities are endless!!!!!!! I have never heard of this before. But it sounds wonderful – and very versatile. Kevin – thanks so much for posting this. I watch Richardo very often and have never heard him reference it. He’s such a fun chef to watch. What a neat combination of spices with alot of possibilities. Now I can officially say I know what dukkah is. I really must try this. I would of course have to try a spicy version! This looks good – I’ve been looking for a dukkah recipe that doesn’t make a huge quantity, and the addition of the nuts makes it even better! I’ve never heard if this but it sounds fabulous! And it’s got lots of possibilities, too. Thanks so much for sharing, Kevin! Yum! I bet it is really aromatic. Looks very interesting. I like the idea of using it as a coating for fish. I’ve just made this last weekend…and I can’t keep out of it. SO good. Bread dipped in olive oil, dipped in dukkah is the best. Also excellent to dip are hard boiled quail eggs!